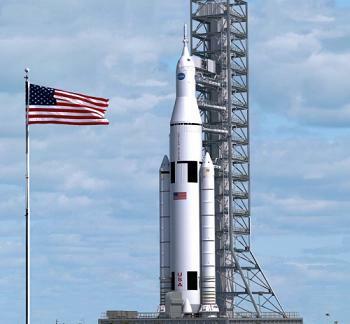 The debut of the Space Launch System (SLS) will send the Orion (MPCV) on a 7-10 day mission to the Moon, with an aim to qualify the Heavy Lift Launch Vehicle (HLV) and Beyond Earth Orbit (BEO) Orion to carry humans into deep space. Exploration Mission 1 (EM-1) involves sending Orion around the far side of the Moon, prior to a splashdown in the Pacific Ocean. With a launch date of December 17, 2017, the historic mission will aim to hand NASA a Christmas present of becoming a successful pathfinder for crewed flights on the new spacecraft, in turn providing a baseline for a return to exploration in deep space for the first time since the 1970s. Launch date slips are a natural part of the space launch business, although the development roadmap for the SLS shows a large amount of schedule mitigation through the key review milestones leading up to the opening mission. Ironically, the main threat to the schedule target may be due to problems unrelated to Orion or the SLS. This is due to the law of then 2010 Authorization Act, which requires SLS and Orion to provide a back-up role for the International Space Station (ISS), in the event of major disruption in the Commercial Crew arena. This would be an undesirable situation for all concerned, not least because the 70mt SLS and BEO Orion would be vastly overpowered – and economically overpriced – for the role of lofting astronauts to the orbital outpost in Low Earth Orbit. At the same time, it would mean the Commercial Crew partners would have failed to achieve their designated role several years after the initial target of 2015. A worst case scenario – where both commercial crew and SLS/Orion were unavailable – would result in NASA continuing to pay the Russians for ferrying up US astronauts to the ISS on the Soyuz. While budget concerns have raised fears the return of a US domestic crew launch capability may not be ready until 2017, Bill Gerstenmaier, Associate Administrator for Human Exploration and Operations, insisted no plans were being made at this time to use Orion in such a back up role at this stage. Should the future transpire as planned, commercial companies – under contract to NASA – will have taken over the role of the Russian Soyuz for US astronauts, allowing NASA to press on with the return to the exploration of deep space. While Orion will gain an important test via the Exploration Flight Test (EFT-1) in early 2014 – a major milestone for the heatshield/Thermal Protection System (TPS) via an entry profile that will match a return from deep space – this mission will be launched via a Delta IV Heavy (D-IVH). Three years later, the first SLS will be assembled in the Vehicle Assembly Building (VAB) at the Kennedy Space Center (KSC) – with the “full capability” Orion MPCV integrated atop of the HLV, prior to being rolled out on the Mobile Launcher to Pad 39B. The 318 feet, 70mt SLS will feature two of ATK’s five segment Solid Rocket Boosters (SRBs), four RS-25Ds donated from the Space Shuttle Program (SSP), a core built by Boeing at the Michoud Assembly Facility (MAF), an avionics suite/instrument unit, a kick stage – or Interim Cryogenic Propulsion System (ICPS) mated to the Orion, with the Spacecraft and Payload Adapter and Fairing being topped off by a Launch Abort System (LAS). Teams are likely to mirror a real human mission, with the same Launch Commit Criteria (LCC) and Firing Room procedures, along with a closeout crew at the pad. The countdown and procedures for launching the SLS are covered in the specific SLS Concept of Operations article recently published on this site. The outline takes over once SLS has launched Orion into an high-apogee orbit of 975 nmi at the insertion point, following Main Engine Cut Off (MECO) of the four Pratt & Whitney Rocketdyne RS-25Ds – four engines that will be potentially (depending on their selection) providing their swansong after providing assistance during Space Shuttle launches. They will be destroyed when the core stage re-enters and splashes down in a pre-determined disposal corridor. 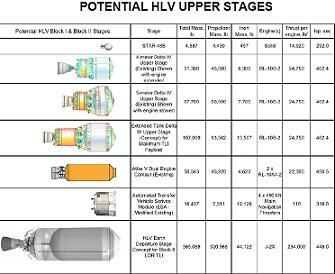 “Notional Mission Event Sequence: 1) SLS lofts Orion to high-apogee orbit, while meeting core disposal constraints,” noted the EM-1 overview. With Orion – and its kick stage/ICPS – in space, a Trans Lunar Injection (TLI) burn(s) needs to be conducted, to send Orion on a path towards the Moon. The eventual Upper Stage of choice – which will sport J-2X engines – will not be used on this mission. Instead, the role of the kick stage/ICPS will most likely be conducted by a Delta Cryogenic Second Stage (DCSS) – following on from its role during the EFT-1 mission. Draft versions of the EM-1 mission outline named this as the stage of choice for the mission. However, the more recent SLS presentation simply classes the kick stage as “TBD” (To Be Decided). 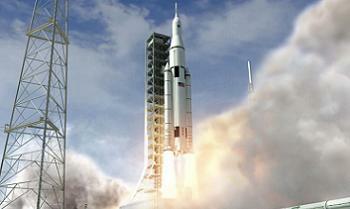 After all, with the mission over five years away, a different stage could be chosen if SLS teams so wish. The options for a stage that could perform a role are plentiful, as seen during the Sidemount HLV evaluations – as much as the DCSS is still considered the favorite. NASA managers have also released details of the requirement for the ICPS via an acquisition synopsis, which in turn provides additional details on the TLI burn requirements for the Orion heading to the Moon. “The early flights of the SLS architecture will require the use of an ICPS to ensure the placement of the Orion on the required trajectory. In order to support the flight schedule, the initial ICPS flight unit must be delivered to KSC no later than late in the fourth quarter of the 2016 government fiscal year (GFY),” noted the synopsis. “Requirements: Human Rated or Human Ratable for Space Systems. Burns (accelerating Orion/MPCV) following placement of ICPS and MPCV at insertion point by SLS. Three engine ignitions to achieve greater than 3050 m/s delta-V. ICPS Lift Capability total weight of 24224 kg (53404 lbs). ICPS Mass less than 71400 lbs. Based on the above requirements, the winning ICPS/Kick Stage may perform around three TLI burns to achieve the goal of sending Orion on its way to the Moon – given one burn would not provide the required delta-V. It was also listed that the typical duration of ballistic phases between burns will be 50-270 minutes between the first and second burn, while it has not yet been decided how long a duration is required between the second and third burn. It will also provide its own disposal burn once separated from Orion – listed at <50 m/s delta-V – to safely dispose of stage. As noted above, the length of the mission will be determined by the transit time, as Orion arrives at the Moon, transits around the far side at a High Lunar Orbit (HLO), and heads back to Earth on a Free Return Trajectory. 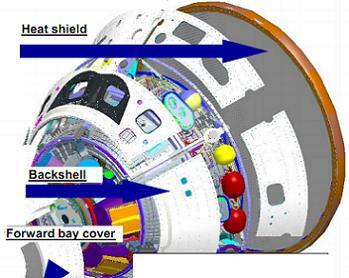 “Orion BEO configuration: Lunar-capable heat shield. Two-tank service module and propulsion offload for lower mass. 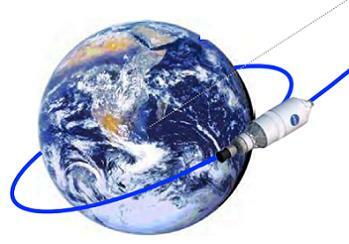 Kick-stage motor (TBD) provides trans-lunar injection (TLI). 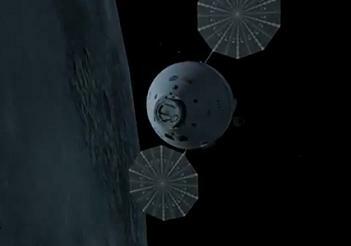 Orion mission duration: 7-10 days,” added the overview. With Earth beginning to grow in size in the window, the spacecraft will prepare to head towards what would be the second test of the heatsheild – following EFT-1 – except this time the return will be from deep space for real. 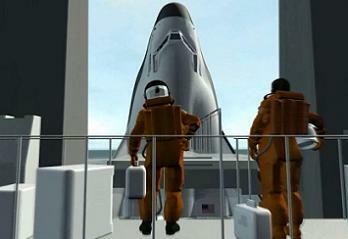 This return is a major part of the top level objectives for the mission. “Top-Level Objectives: Demonstrate spacecraft systems performance to verify for safe crewed flight. High-speed entry (~11 km/s). Thermal Protection System performance,” added the EM-1 overview. For Orion’s Thermal Protection System Advanced Development Project considered eight different materials, NASA downselected to an Avcoat and Phenolic Impregnated Carbon Ablator – with a technical name of AVCO 5026-39 HCG (Filled Epoxy Novalac in Fiberglass-Phenolic Honeycomb).- meaning the business end of Orion’s heatshield will be similar to that used by the Apollo spacecraft. The backshell, however, will have several hundred tiles, exotically named as TUFI coated AETB-8 tiles, bonded to 10 panels of composite laminate facesheets on a titanium honeycomb core. Originally, the baseline for the backshell was a SLA-561V material with plasma sprayed aluminum coating for on-orbit thermal control. However, the AETB-8 tiles provide more mass-efficient MMOD (Micro-Meteoroid Orbital Debris) protection. As such, panel tile thickness, substrate facesheet thickness, and core density are tailored for thermal and structural load, and MMOD requirements. The tiles will be mechanically attached to the pressure vessel with thermal isolating brackets along their edges, a process which has already been practised on an entire C panel for the Orion Ground Test Article (GTA). 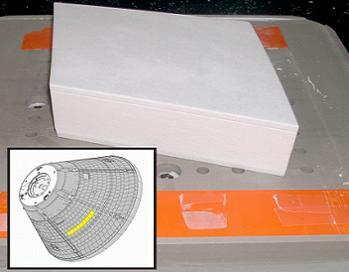 The first EFT-1 tile has already been manufactured. These same tiles will be added to the Orion set to conduct EM-1. Protecting Orion through the re-entry phase of the mission, the spacecraft will bleed off energy, prior to the deployment of the drogue chutes, which will slow the vehicle down to a velocity and attitude acceptable for their release. 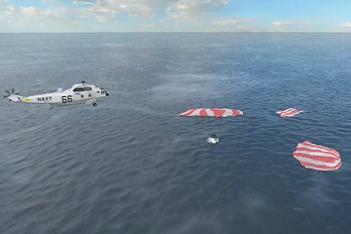 The three main parachutes will then deploy, slowing Orion down towards its splashdown in the Pacific, where support crews will race to the vehicle by boat and helicopter. The Orion will be recovered and shipped back to land, allowing for inspections to be carried out on how the spacecraft performed during its mission. Opening inspections are likely to take place on the vessel returning Orion back to port, followed by further inspections once a crane has placed the spacecraft on solid ground at the port. All of the mission data will be feed into a post-flight review – likely to be similar to the In Flight Anomaly (IFA) review conducted by NASA after shuttle missions – which will likely be part of a subsequent qualification period, allowing SLS and Orion teams to provide the approval required to allow human crews to fly on the launch vehicle and spacecraft. The following mission – SLS-2/EM-2 – is set to take place “as early as” 2019 and would be a mirror of EM-1 – except this time with a crew of up to four astronauts.